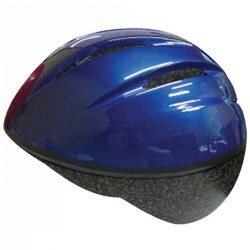 Protect children with these safe, attractive helmets with adjustable chin straps. Fits most children with head sizes of 18 to 19 1/2 inches. 5 vents. Clean with mild soapy water. Clean with mild soapy water. 2 - 3 years. 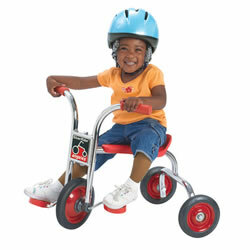 Seat: 13 1/2"H. Handlebar: 20 1/2"H.Trike has a Comfort back support and a heavy-duty rubber handle-grip. 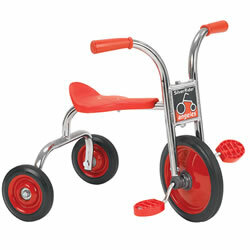 The trike is well made with durable chrome plating, welding steel frame and solid rubbler tires. There are no exposed hardware on pedals to sctratch little legs and no spokes to catch little feet. 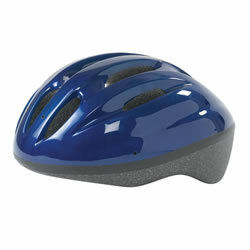 Protect children with these safe, attractive helmets with adjustable chin straps. Fits most children with a head size of 19 1/2 to 21 1/2 inches. 10 vents. Clean with mild, soapy water. Extend the lives of your trikes with our full service maintenance kit. 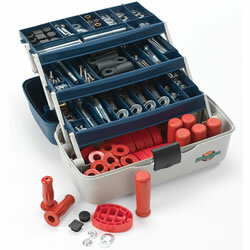 Most parts can be installed easily with minimum tools and training. Includes pedals, handle grips, pal-nuts, bolts, lock nuts, bearings and more. A total of 194 parts in all! Packaged in a durable partitioned case. Wt 14 lbs. 18 - 24 months. Sturdy, extra-stable, fun to maneuver, and just the right size for toddlers. Seat height is 12 1/2" and Handlebar height is 19 1/2" with a 5 year guarantee.